Unfortunately, I don’t have an entire back story about Caitlyn’s conception. Ed and I were not being particularly careful and my cycles were completely erratic. I took at least one pregnancy test a month because after ceasing nursing at 7 months (along with coping with the demands of an infant) I had no idea where I was in my cycle at any given time. There was a work Christmas party on 12/16/04 and I planned on drinking for maybe the 3rd time since I had Eddie. When I woke up that morning I had it in my head to take a pregnancy test before I went to dinner or else I would never forgive myself. For peace of mind, you know. I did not even consider for a second that it would be positive. I had never experienced a positive home pregnancy test since I found out about Eddie in the doctor’s office. I peed on the stick and continued on with my business. It blared a positive result after about 3 seconds. I, of course, went in to panic mode. I had an 11-month-old. And I was pregnant, again. I was just starting to look normal again. And oh.my.god. What was Ed going to say? I woke him up at 6:00am. He’d had no idea I’d even taken the test. I told him, we talked about it a bit, and decided that we were totally fine with it. We told our families early this time, over Christmas, with Eddie wearing an “I’m the Big Brother T-shirt” on Christmas Eve. We wrapped it up for my mom to help Eddie open on Christmas Day. People were surprised, for sure. But we all knew that Caitlyn was meant to be. 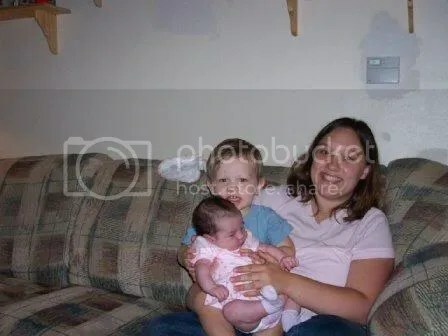 My due date was 8/26/05. 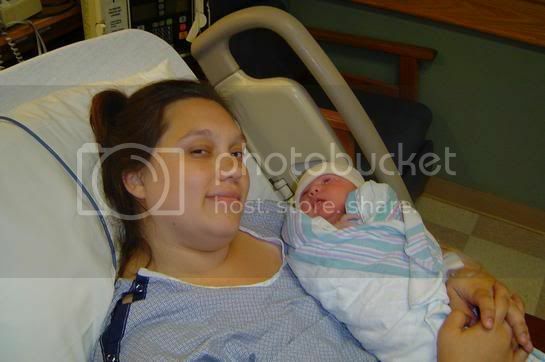 Early on in the pregnancy, I contracted a horrible kidney infection and was hospitalized for 2 days. I continued to have urinary tract infections through the pregnancy, but that was my only complaint. In comparison to my first pregnancy, this one was cake! As much as I hated pregnancy the first time around, I just loved it this time. I was never sick. I was no more tired than I had been while caring for Eddie. I felt great! The cravings were a lot different the second time as well. I still drank my coffee, 1 cup of regular in the morning and a cup of half-caf in the afternoon. I loved on strawberries and whipped cream. I needed to have Cedar Point Corn Dogs and Ed wouldn’t go get them for me. Instead, I wrapped hotdogs in crescent rolls and ate them for lunch and dinner for at least 2 weeks. I went to Starbucks almost daily for the strawberries and crème frappucino with a shot of vanilla. I knew from the beginning that this was a girl, and we had it confirmed with our 20 week ultrasound. 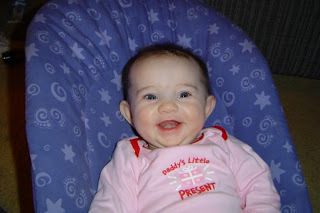 We knew her name already, and until about 3 weeks before she was born it was going to be spelled Catelyn. I changed it to Caitlyn and then we moved on to the middle name, (which to this day, Ed is not a fan of.) Her name would be Caitlyn Renee. We traveled to Virginia Beach and Richmond when I was 8 months pregnant and it was probably the most miserable car ride of my life. We walked everywhere though and had a really good time. 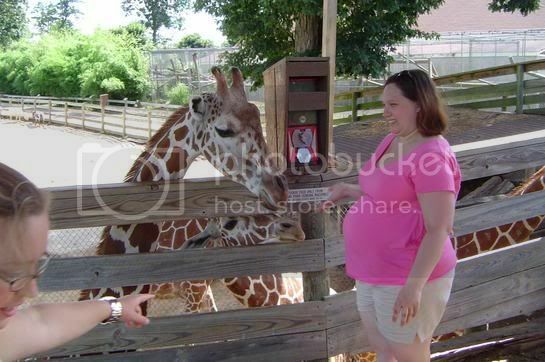 Here is a photo of me 8 months pregnant feeding a giraffe. 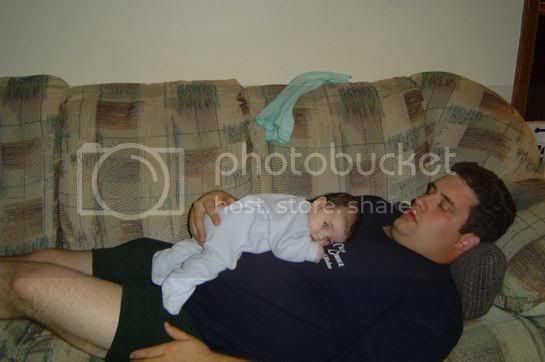 If you recall the photos from my 1st pregnancy, you can see that I carried her a whole lot differently. She was up high and under my ribs for the entire pregnancy. I worked up until the beginning of August. The summer averaged about 90 degrees every day and I could hardly walk because my ankles were so swollen. I saw the one doctor at my practice that I hated, and she pulled me, so she was my new best friend. I wanted to nest, I really did, but I could barely move. I had until the end of the month, right? The good news was that we had never put the bassinette away after we moved Eddie to the crib. All I had to do was put the linens back in. I did manage to get her clothes washed and put away in all of their pink and frilly over-abundance. On August 16th, we went to our county fair. I was having tons of contractions as we walked around in the 95 degree heat. Figuring I was dehydrated, I drank 3 bottles of water. Everything settled down by the time we got home. I went to the doctor in the morning and saw my very favorite midwife, the one who assisted in delivering Eddie. I told her about everything that was going on and she checked me out. I was 2 cm but very thinned out so she stripped my membranes with her finger. (This apparently separates membranes from the cervix…….I can still feel it when I think about it. Not cool.) She was sure I would go in to labor that night. I was nervous because Ed was working out of town that day, but the contractions held off. I honestly had my first one as he walked in the door at 7pm. They were sporadic all night and I went to sleep in the recliner wondering if I actually was in labor. I woke around 2am definitely in labor. I had the classic feeling of “maybe if I just poop I’ll feel better.” I didn’t. I woke Ed up and told him we had to go. Then I proceeded to do 150 other things to make sure Eddie was taken care of. I called the midwife (the nasty one was on call) myself and she told me that if I was talking to her, there was no way I was in hard labor, but that she would meet me at the hospital anyway. 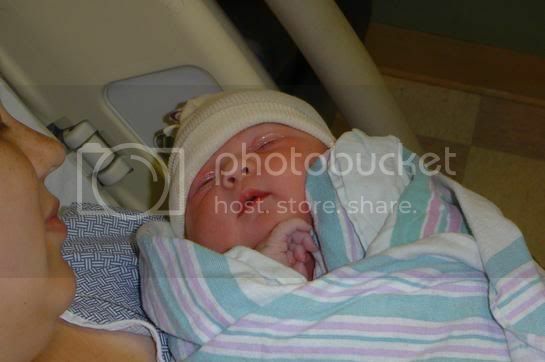 Caitlyn Renee was born at 5:37am on August 18, 2005. She weighed 9lbs 5oz and was 21 inches long. 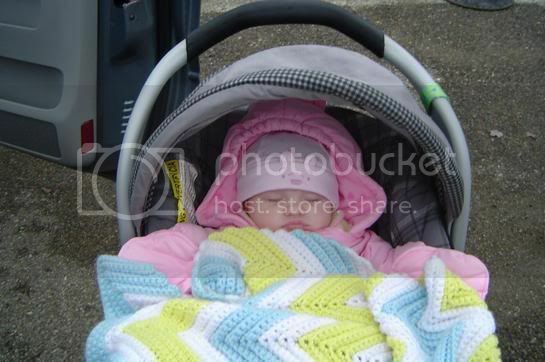 As with her brother, the NICU was paged because of her size. She was also hypoglycemic, but the doctor also felt an abnormal bulge in her belly. She was taken away before I could nurse her, and just after I held her for a minute. They were afraid that the bulge was an intestinal problem, and didn’t want her to eat anything, so they started an IV to get her blood sugar up. We were relieved to hear that there was absolutely nothing wrong with her after a few hours, but disappointed to hear that because an IV was started, they would have to wean her off of it. Unlike an adult, a baby couldn’t handle the IV just being taken out and it had to be reduced gradually. And so began the long ordeal of Caitlyn in the NICU. I could go up there to nurse her, but they were giving her formula to keep her sugar up. Every time they reduced the IV, her levels dropped just enough to be considered “unstable”. Day one turned in to day two and she was still on the IV. All of my hopes and dreams were shattered in this horrendous post partum state. She was supposed to be in the room with me, and Eddie was supposed to come bounding in, wearing his big brother t-shirt, and climb up in my bed and hold his baby sister for the first time. Everyone was supposed to be there to fawn over my baby girl. Instead, Eddie came for about 30 minutes and played cars with me on the floor in my hospital room. Outside of Ed’s Mom, his Aunt Gail and Uncle Rich, and Marisa and George, nobody came to see me. 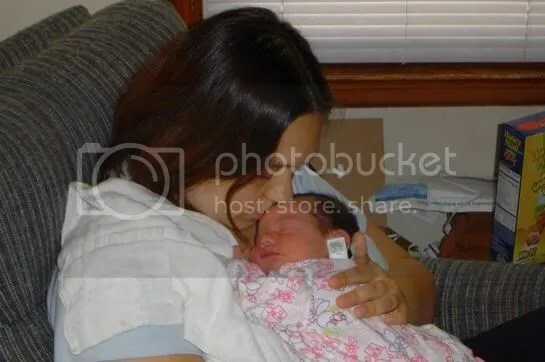 Why would they if they couldn’t see the baby, right? I gave up at that point. I didn’t go up and nurse her regularly. I stayed in my room, slept and watched TV, checking on her sporadically. Ed and I fought because I wasn’t doing enough. I just couldn’t do it, physically or mentally. Day 3 arrived and they had no idea if she would be released along with me. Her final reading was scheduled for 10pm. I decided that sitting around the hospital hoping she could come home wouldn’t do anyone any good, so I went home. I pumped. I spent time with Eddie. And then Ed and I went to his 10 year high school reunion for a bit and waited for a call. The hospital did call just after 10 to say that we could come and get her. Her reading was still low, but nothing that I couldn’t handle, they said. So off we went. I still hadn’t put the bassinette linens on and the car seat straps needed to be adjusted from the last time Eddie used it. 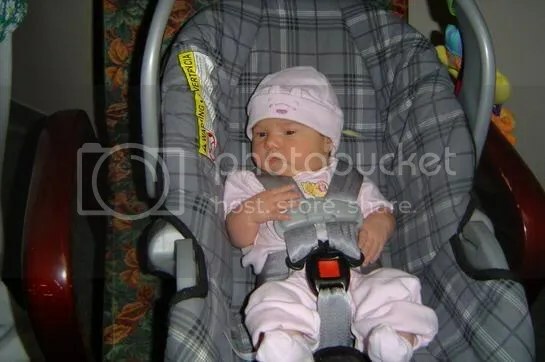 I went to the NICU for the final time and put her in her going home outfit, even though it was after 11 by the time we got there, and we took our baby girl home. Fortunately, this was where any feelings of depression subsided. 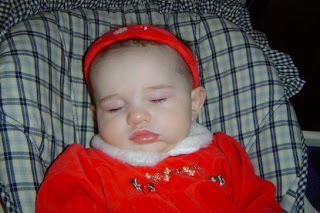 Caitlyn was a great baby, came home sleeping 4 hours at a pop. She fit right in. 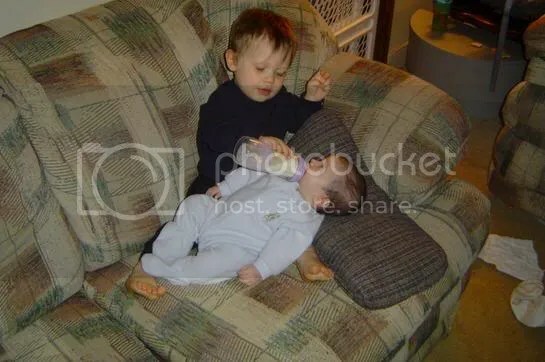 Eddie wasn’t thrilled with her at first, as she took up a lot of my time, but he quickly became a good big brother. We got in to a routine right away because Ed worked a lot. I kept her in the front carrier quite a bit so that my hands were free to tend to Eddie and housework. She came to the park with us, on the car ride while I took Eddie to school. I think the most important part of integrating her in to the family was keeping everything very much the same. She did what we always did. Our family was, and is, perfect. I spoke briefly about this in my 100 facts list. 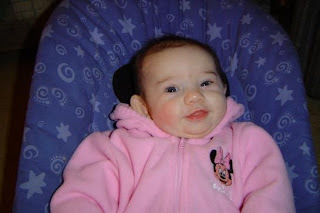 When Caitlyn was about a month old, she spiked a really high fever and was hospitalized with suspected meningitis. A ton of tests determined that it was just a viral infection; however, they kept her hospitalized because a baby that young should not have a fever. I spent three days in the hospital with her, nursing her, hanging out and taking care of her. At that point, I felt like we finally bonded. Ed said it to me then, and I truly believe that this was sent from God. No, it is never fun to have your child hospitalized and it was certainly stressful. But I spent the time with her, just me, alone, that I should have to begin with. And somehow, I finally felt complete. He does work in mysterious ways. Posted in caitlyn, childbirth, pregnancy. Bookmark the permalink. Can I simply say what a relief to uncover someone who truly knows what they’re talking about on tthe internet. make it important. More people must check this out andd understand this side of your story.